As a community, we’re improving health outcomes for patients around the world. To achieve this goal, we’re developing open source analytic tools and generating high quality evidence to inform medical decision making. Whether you’re a software developer, physician or clinical researcher, there is a place for everyone in the OHDSI community. 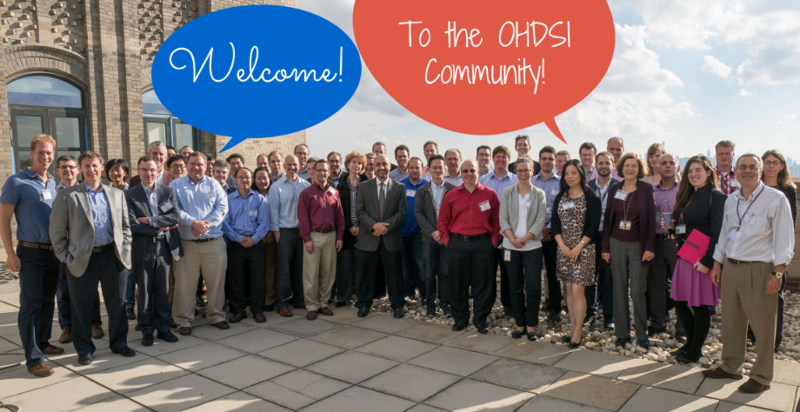 Want to become an OHDSI collaborator? Click below to get started now! 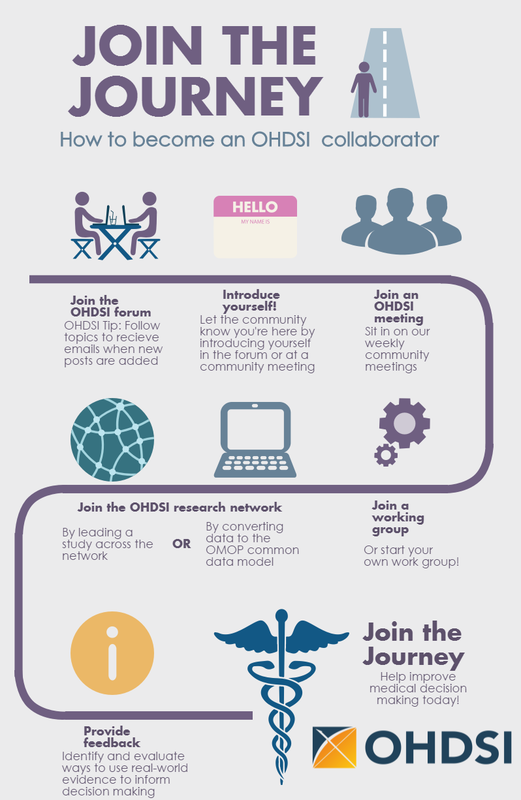 Connect with other OHDSI collaborators on our community forums and start discussing how you can help us inform medical decision making. OHDSI Tip: Once you have a forum account, you can select topics to ‘watch’. What this means is whenever a new post is added in a topic you’re watching, you will receive an email and be able to reply to the post directly through your email. Watch the general thread to recieve details about upcoming meeting agendas, collaboration opportunities and have the weekly OHDSI digest delivered directly to your inbox! Learn more about OHDSI by watching our online tutorial videos and symposium presentations. Every Tuesday from 12-1pm ET the OHDSI community comes together to share our recent developments and recognized the accomplishments of individual collaborators, working groups and the community as a whole. The community meetings are a great chance for newcomers to get aquainted with what’s happening across the OHDSI network. All newcomers are asked to introduce themselves on their first call and telling the community about themselves, their background and what brought them to OHDSI. If you’d like to join an OHDSI call, please contact Maura Beaton at beaton@ohdsi.org for join-in details and to let her know which date you’ll be joining. Design, develop and test open source analytic tools. Check out the OHDSI GitHub to get started now! Convert your data to the OMOP common data model and join our international data network.